Polished Patterns is a new member in the ever-growing SuperWeb family of adware. If your browsing experience is disrupted by annoying pop-up advertisements, there is a chance that you have been infected with Polished Patterns. Although this application claims on its website that it can save you time and money, it will only make your surfing painful, not to mention the related potential security threats this adware poses. Since it likely entered your system in a free software package, you might be in bigger trouble than your screen swarming with ads. This application might be a source of multiple threats to your operating system. Thus, we recommend that you delete Polished Patterns ASAP, if your virtual security matters to you. 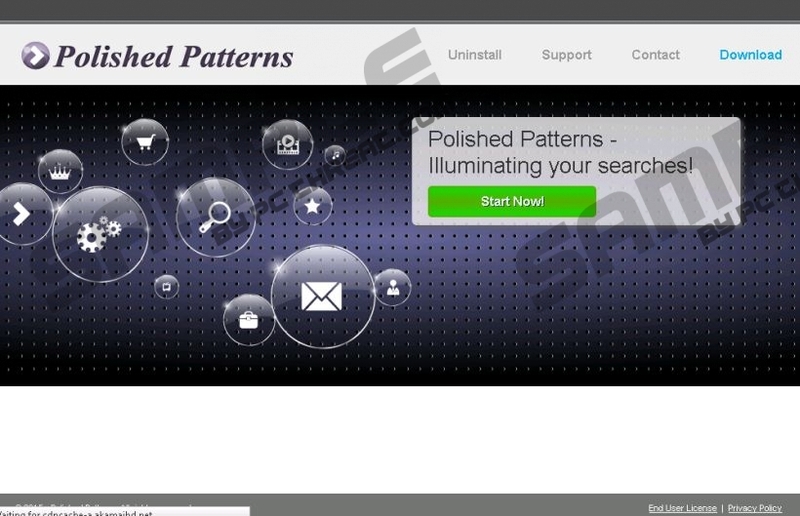 Polished Patterns advertises itself on its official website, polishedpatterns.com, as an application that can “enhance your browsing." However, on the main page you cannot find any information at all about what Polished Patterns is about. There is simply one label saying that the app will “illuminate your searches," whatever that means. Unfortunately, even if you decide to "illuminate" and enhance your browsing by clicking on the "Start now" button, you cannot download Polished Patterns. It is rather suspicious behavior and makes you wonder, how on earth this adware enters your system. Similarly to other family members, including Cooking up Coupons and Box for You, Polished Patterns also travels in freeware bundles. It is important that you understand the hidden potential in these software packages. Third-party installers might use them to spread malicious infections. This means that you might end up with a number of threats installed on your computer if you do not go for the Advanced installation option, where you can usually deselect the unwanted software or tools. However, most users ignore this and install the whole package. In this case your system’s security might be endangered. If you do not want to risk that, you need to delete Polished Patterns as soon as possible. We encourage you not to provide any personal information or access any third-party content unless you know and are comfortable with its provider. There is no doubt that you should remove Polished Patterns from your computer if you want to restore your system’s stability. Fortunately for you, it is quite straightforward to get rid of Polished Patterns. All you need to do is uninstall it via Control Panel. Please follow our instructions below if you do not know how to do that. Keep in mind that there may be other threats on your system that you need to take care of, too. We recommend that you invest in a powerful antimalware tool that can automatically detect and remove all known infections. Slide the mouse cursor to the bottom left corner and right-click on the Windows logo. Select Polished Patterns and click Uninstall. Double-click Polished Patterns in the list and click Uninstall. Press the Windows key on your keyboard and go to Control Panel. Select Polished Patterns and click Remove. Quick & tested solution for Polished Patterns removal.